A shower can be a dangerous environment for someone in a wheelchair. Learn how to create wheelchair friendly showers for the handicapped. When you or a loved one must depend on the use of a wheelchair due to an injury, age, handicap or safety concerns it may feel as though you are losing a great deal of independence. One way to maintain some of your freedoms and sense of independence is to create an environment within the home that allows for you or your loved one to still be able to take care of their own personal needs in a safe manner. One major aspect of this is to install wheelchair accessible showers so that the individual can still bath and shower with little assistance with this much necessary task. 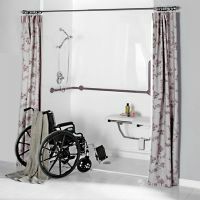 There are some guidelines that are set in place by the Americans with Disabilities Act to insure that the shower stall is constructed in a safe manner that will be both beneficial for the individual while providing the tools to assist them in areas that can be detrimental to their safety and security while bathing. Here are some specifications that should be set into place when designing a wheelchair accessible shower unit. A seat is required for the individual to have a place to sit while tending to their showering needs. With there being two basic size shower units consisting of a 36 inch x 36 inch unit or a 30 inch by 60 inch unit, the set up can be different. In a 36 inch x 36 inch unit, the seat should be stationary and positioned facing the controls on the opposite side of the shower. There are plenty of options available. In a 30 inch x 60 inch shower unit the seat can either be a stationary seat that is positioned on the opposite wall facing the controls or on the same side as the controls as long as the seat is a folding style. Grab bars must be installed along the back wall of the shower unit to assist the individual with transferring from the wheelchair to the shower seat. You can also install grab bars on the outside of the shower unit to help with balance and stability. All of the controls, faucets and shower head units should be mounted on the opposite wall than where the seat is positioned if possible. A shower caddy for private homes can help put the shampoos and soaps in a reachable area. The most ideal shower sprayer unit for wheelchair friendly showers is models in which the shower head is attached to a hose that is at least 60 inches long. This type of handicap shower head can be used either in a stationary manner or as a hand-held sprayer. If a stationary shower unit is installed, it should not be positioned more than four feet from the bottom of the tub on the wall opposite of the shower seat. This will help to prevent the individual from needing to reach over their head, creating a slip and fall risk. The most ideal wheelchair friendly shower units should not have a curb. However, if you have a 36 inch x 36 inch shower pan, it is acceptable for the curb to be no more than ½ inch high. There should never be any type of shower enclosure installed on a shower unit that can interfere with transferring back and forth to the shower unit. This most often includes shower doors that slide or open up in a limited amount of space.